Is owning your own quilt shop at the top of your “dream” list? I’ve been selling fabric online for over 10 years and while it is the most exhilarating thing I have ever done, the truth is, it takes a lot of time and effort to be successful! For today’s post I want to focus on the first of two store options – starting an online shop. Next week I will share some information about running a brick and mortar shop, with the help of my colleague Jennifer Albaugh from Quiltique. No matter which path you choose, listed below are a few steps you’ll need to consider before taking the plunge and creating your dream store. Remember, this is just the tip of the iceberg; be sure to research specific questions you may have online, attend business seminars, and read plenty of books on starting your own business. You’ll need to establish a wholesale account before you can start ordering from suppliers. This isn’t difficult to do, but it does take time and paperwork. Make a list of companies whose products you’d like to carry and then contact them about their minimum orders and needed credentials. Most companies just want to know you are a “real” business and will require a tax identification number. Some companies will only do business if you have a stand alone website so be sure to do your homework and ask. Set aside more money than you think you need. It goes without saying that it takes money to make money. You don’t want to quit your day job before you are sure that you can live on the uncertain income that being your own boss provides. Can you weather a downturn in the economy? Do you have sufficient savings and health insurance? The sure-fire way to fail quickly is to be constantly stressed about money. There are small business loans you can acquire, but if you are prudent and start small, your income can grow over time as your business grows. Plan your inventory before you buy. Think long and hard about which niche you would like to fill. Unless you have a huge start up budget, it’s hard to be all things to all people. Think about which market you want to cater to: the younger crowd, modern quilters, repro and retro trend setters, batik lovers, or floral fanatics, etc. If you cater to a specific crowd, word will spread quickly that you are THE specialty shop they are looking for. This will also help you avoid the “race to the bottom” mentality of constantly trying to undercut your competitors. Provide a good customer experience and you will keep them coming back for more. After all, there’s room for all of us in this creative industry! Enlist your friends and family to help out! I started my shop 10 years ago with 6 bolts of fabric: selling fabric to my friends, quilting students, and fellow guild members. It took about a year to reach 300 bolts and open up my first store on eBay. All profits from the business were reinvested so that I could grow quickly. EBay was a great place to start because the barriers to entry were low: all I needed was a userID, a camera and a paypal account and I was in business! In fact, the name ChristaQuilts came from my humble beginnings on eBay. At the time I couldn’t think of anything better, so it just stuck. Etsy came around soon after and although I didn’t have much success with it (mostly because the timing wasn’t right), it’s now grown into a vibrant and sustainable marketplace and a great place to both buy and sell. It has many of the same benefits as eBay. Etsy has huge brand recognition, gets tons of traffic, and it’s easy to open a store quickly. Working from home can take over your space! Just understand that if you are considering selling online, it takes up lots of time and space. Unless you are planning on renting out a warehouse, be prepared for your business to take over a large part of your house, or have a dedicated space. If you need extra help, be sure to enlist your friends and family members. If you are working from home, you don’t want strangers in your house! Once I realized I had a reliable online business model, Jason quit his job to build and run our website full-time. 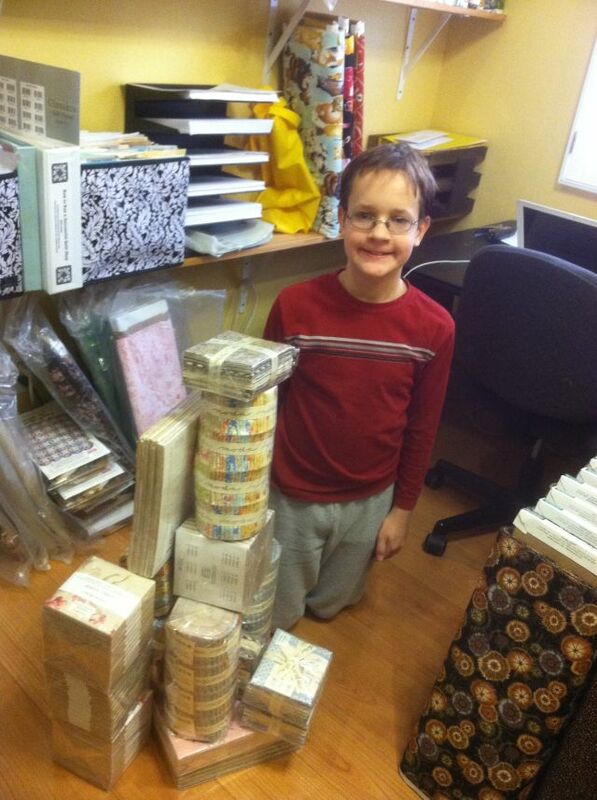 At the height of our capacity we carried about 2000 different items in our store. Jason had the skills and interest to maintain our website, but we have spent a lot of time, effort and money to get it seen by a wide audience. Who knew that precuts could double as building blocks? 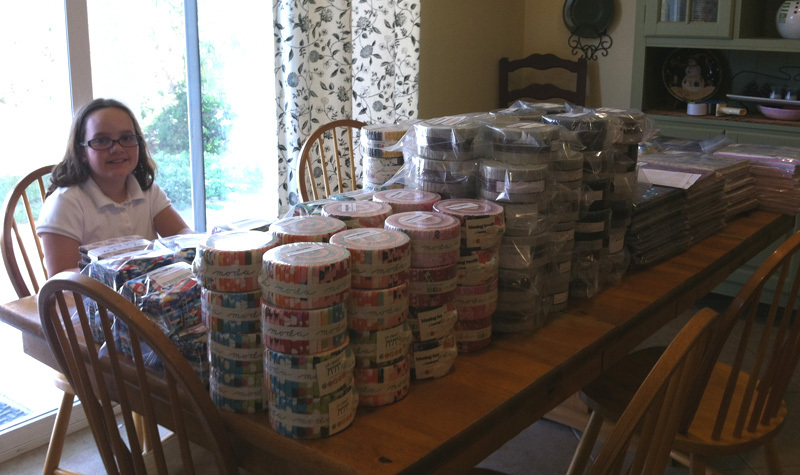 Our current experiment is with selling precuts and thread on Amazon but this was a very lengthy and difficult process to set up. The commissions and fees are extremely expensive and require a huge investment in inventory to maintain, so we are still analyzing the cost/benefit ratio. It’s also hard to list new items because each one requires its own individual barcode and not all manufacturers provide those. I wouldn’t recommend it for new businesses just starting out. So to summarize: yes, you can own your own shop. Starting small online is probably the best place to begin and you can grow as your success increases. Because this is such a broad topic, please feel free to ask any questions and I’ll be glad to answer them! Christa’s Soapbox – Do What You Love! d the country and has a stand but the shop itself is very hit or miss…and she isnt getting any younger. Do you have any advice on what to do? I have been thinking about doing something like this for over a year now. One big question I have is, how do I find whole companies to purchase “by the bolt” fabrics? Google I seem to only find by the yard. Thanks great article answered alot of what I was thinking about. I just found this blog, and was reading the comments. I hope you stuck with the quilting!! Love the photos of your sales help! Really loving this series. Thank you! Thanks for the candid view of what a store based business would entail. This blog theme is really appreciated.